The fungus spends the winter in fallen leaves that were infected last season. Fruiting structures develop in the spring and spores are released during wet weather to drift onto newly emerging leaves. Infections occur if the nascent leaves remain wet for several hours. Secondary infections can occur throughout the season if supported by wet conditions. Environmental conditions in much of Ohio have provided a perfect storm for infections by this fungal pathogen. The result was very evident as I hiked in the woods of a county park in southwest Ohio last week. I could easily identify both Ohio buckeye (A. glabra) and yellow buckeye (A. flava) trees at a distance by their striking orangish-red canopies. Disease symptoms generally appear as zonate lesions on the leaflets that are often surrounded by a yellow, chlorotic halo. Usually, the lesions are at first small, reddish-brown, and often bounded by the leaflet veins. Occasionally, these zonate lesions are various shades of red; from crimson to brick red. Eventually, the infected areas expand to become large, reddish-brown to dark brown blotches that may envelope the entire leaflet. As the common and scientific names indicate, this fungus focuses its infectious attention on members of the Aesculus genus including certain buckeyes and horsechestnuts. However, all Aesculus are not equally susceptible. For example, based on my observations and those of others, lesions seldom appear on bottlebrush buckeye (A. parviflora). Unfortunately, we only have anecdotal observations to consult for avoiding leaf blotch through plant selection. To my knowledge, there has never been a replicated trial to evaluate the susceptibility of various members of Aesculus. This means our plant selection decisions are at risk of being guided by questionable observations. I came across an online publication while prepping for this report that listed red horsechestnut (A. x carnea) as being resistant, yet I've taken some of my most dramatic images of leaf blotch symptoms on the cultivar 'Briotii'. I'm not casting dispersions on all red horsechestnuts; some cultivars may be less susceptible. However, without having data from replicated trials using trees of known taxonomic pedigree, we just don't know. 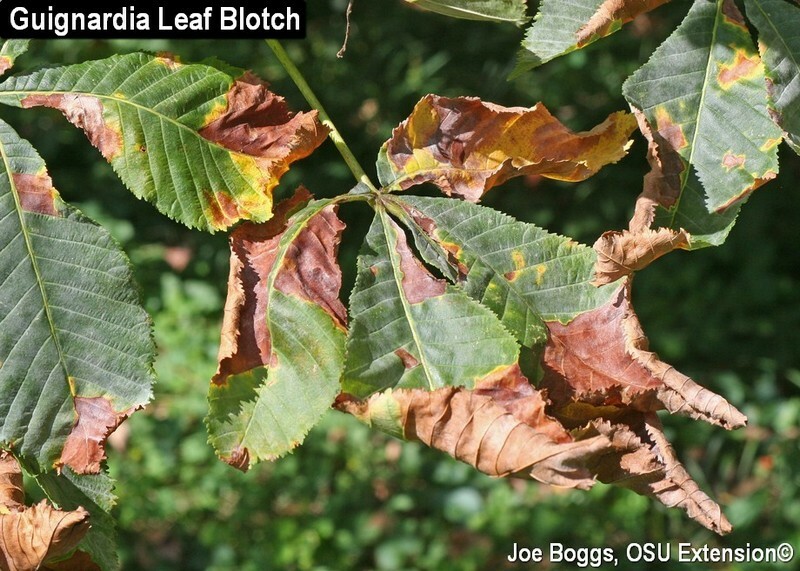 Guignardia leaf blotch seldom causes significant harm to the overall health of established buckeyes or horsechestnuts. However, I’m not certain this is true for young trees and the disease can certainly make established trees look terrible. During my walk in the woods, I came across a number of understory seedlings that were being hammered by the disease. It made me wonder if the leaf blotch could have an impact on forest regeneration. There are online recommendations for using fungicide applications to manage this disease. However, no product will provide protection throughout the growing season which means repeated applications would be required. On the other hand, although we usually see some infections each season, this appears to be a particularly bad year (good year?) for the disease. Indeed, one reason that we don't think of the disease as presenting a serious challenge to buckeyes and horsechestnuts is that we seldom have consecutive years with heavy infections.